You can set a talk with your target audience by handing these promotional logo 3 LED super bright key lights! 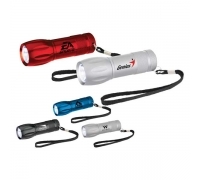 These promotional metal flashlights packs power of the compact promotional gift and come to aid during emergencies. Available in several attractive colors, these promotional flashlights can be customized with your brand logo or message to keep your brand in minds of your customers! Logo printed 3 LED super bright key lights are ideal promotional items for mechanics, emergency services, safety events, construction workers and more. Order today! Request a quote to know wholesale savings for these personalized logo 3 led super bright keylights. Product Size: 2 3/4 " x 5/8 "
Imprint Area: 1/4" x 1/4"